But it came to pass on the seventh day that they rose early, about the dawning of the day, and marched around the city seven times in the same manner. On that day only they marched around the city seven times. And the seventh time it happened, when the priests blew the trumpets, that Joshua said to the people: “Shout, for the LORD has given you the city!” (Joshua 6.15, 16). 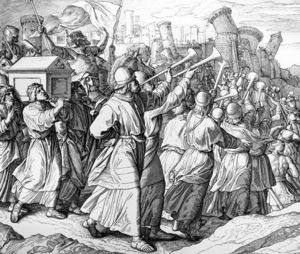 The seventh day, seven times that day, and at the seventh time around the city, the Lord wanted the priests to blow their trumpets and for the people to shout, and shout they did, for it brought the walls down! You will never hear of another army doing such a thing, and if they tried, it would not work, because the marching, the trumpet-blowing, and the shouting did not bring the walls of Jericho down, the Lord did, but He did not do it until the people obeyed Him! This entry was posted in Joshua, Seven and tagged Battle of Jericho, God, Israel, jericho, Joshua, joshua 6, Joshua 6.15-16, Lord, Marching around Jericho, seven in the Bible, seven times, sevens in the Bible, Seventh Day, seventh time, Trumpet, walls of jericho. Bookmark the permalink. I finished reading Joshua a while ago and noticed the same thing. You know that I LOVE finding sevens in the Bible. They’re everywhere! I call it “God’s signature,” not only in the Bible but also in nature. Seven colors of the rainbow and so on. Blessings to you. Yes, I remember of your love for Sevens in the Bible, as well as Sevens in Creation, and I have that same love, which is why I started this web site. You are correct that sevens are everywhere, and I like your conclusion that it is God’s signature!